Successfully Added 3D Android VR Glasses - 5 Inch HD Display, 3D Support, Quad-Core CPU, Wi-Fi, 32GB External Memory, Google Play, OTG, 2200mAh to your Shopping Cart. These Android VR glasses let you enter the astonishing world of 3D online gaming and virtual reality, bringing along countless hours of fun and stunning entertainment for you to enjoy at any given moment. Supporting full 3D movie and game effects, these 3D video glasses truly bring along an experience like no other. Watch movies, play games, or simply browse the web. With these virtual reality glasses your options will be limitless. Now for sale at Chinavasion and available at a remarkably low price, these video glasses are the perfect electronic gadget for people of any age. Featuring a beautiful 5 Inch HD display, these video glasses allow you to enjoy all media in stunning detail. The latest IPS technology provides an ultra-large viewing angle and assures that all games and movies will be displayed in vivid color. Enjoy a true cinematic experience no matter where you are – with these android video glasses it has never been easier. Supporting 8GB of internal memory and providing you with the possibility to add an additional 32GB externally, these 3D glasses are guaranteed to offer enough space for you to store all your favorite games, media, and files alike. Running on an Android operating system these video glasses are sure to offer a smooth and powerful user experience that lets you open up and load any media in no time. Equipped with a Quad-Core CPU that has been clocked at 1GHz along with a Mali-400MP graphic’s unit, these VR glasses support the latest 3D media that can now be enjoyed in truly stunning HD resolution. Simply head out to the Play Store and download hour’s worth of the latest Applications, 3D games, and movies alike. With these 3D glasses at hand, you’ll be all set to enjoy unlimited mobile entertainment – letting you enter entirely new virtual worlds where years of online adventures lay ahead. 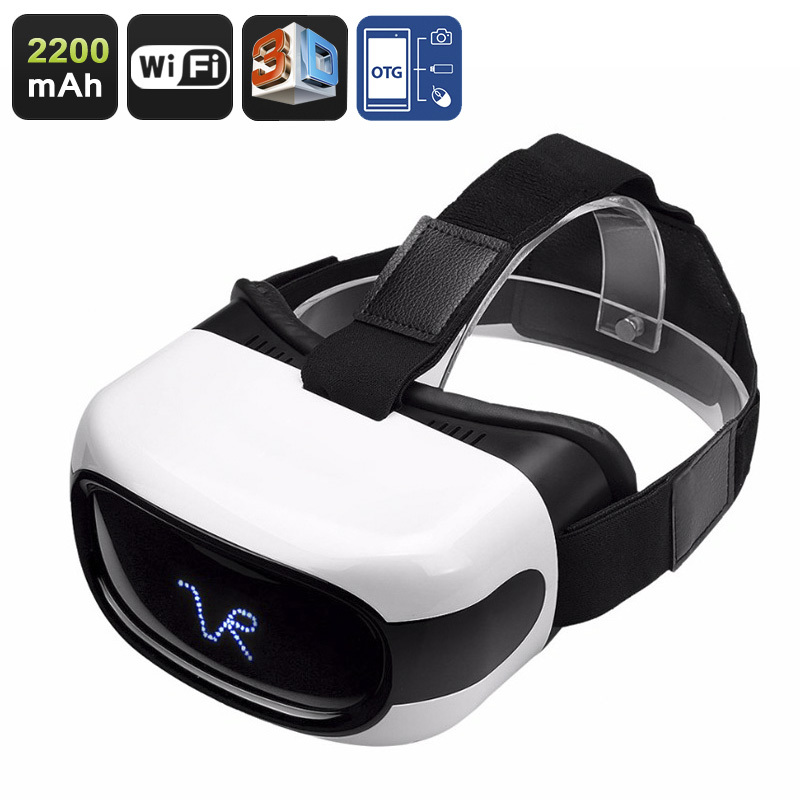 Supporting OTG, these magnificent 3D VR glasses further enhance your overall user experience by allowing you to connect external hardware such as memory sticks to your device. Packing a sophisticated 2200mAh battery these glasses are capable of providing you with up to 3 hours of constant virtual fun before recharging is needed. This offers you plenty of time to get through your favorite 3D movie, play games, or simply browse the web for hours in a row. With its Wi-Fi support, you can be sure that you can always enjoy a stable and fast internet connection, allowing you to take the absolute most out of your VR experience. These 3D VR glasses comes with a 12 months warranty, brought to you by the leader in electronic devices as well as wholesale electronic gadgets..